Shakhtar won the Super Cup! 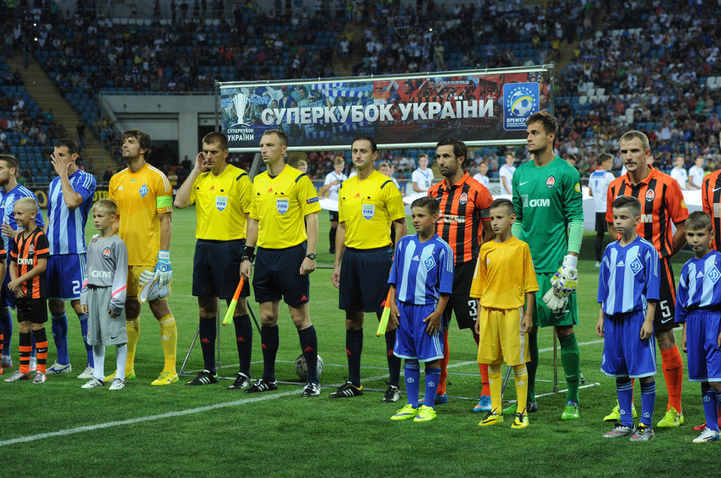 On 14 July, the Pitmen faced Dynamo in the Ukrainian Super Cup. July 14, 2015. Odesa. Chornomorets stadium. Att: 34,164. 22C. Football returned to Odesa after a long break. The stadium was packed. This city saw the start of the Ukrainian Super Cup history. A year ago in Lviv the Pitmen beat Dynamo 2-0 thanks to goals from Oleksandr Hladkyi and Marlos. Both of them were fielded in the starting line-up, newcomers Maksim Malyshev and Eduardo remained on the subs’ bench. Dynamo’s Khacheridi, Belhanda, Lens were not in the starting eleven either. Shakhtar’s captain Darijo Srna played his 10th match of the Ukrainian Super Cup – it is an absolute player record in this competition. Before the starting whistle, there was an awarding ceremony in three categories on the results of the previous season: top scorer, best player, best coach. The awards were received by Alex Teixeira (17 goals), as well as Dynamo’s Yarmolenko and Serhiy Rebrov. Starting from the opening minutes, Shakhtar took the game under control, forcing Dynamo to defend. Soon the Pitmen wasted two clear chances: Shovkovskiy saved a Hladkyi header, and soon Marlos missed the target from a good position, when Taison skipped past the opposition defenders and goalkeeper. The Pitmen’s left flank looked especially energetic, where Taison and Ismaily operated in an excellent manner, with Fred also drifting there. There were two decent shots from Marlos and Teixeira – Shovkovskiy made saves. The Kyiv side threatened Anton Kanibolotskiy’s goal only two times. In the first episode, it was Morozyuk who failed to strike the ball cleanly, and Veloso sent his free kick over the crossbar. Straight after the break, Dynamo’s players stepped their game. Two dangerous episodes resulted in Oleksandr Kucher coming to rescue: first after the ball bounced off the goal post, and then the defender cleared the ball off the goal line. The Pitmen managed to quickly cope with that, forcing the opponents to commit fouls in the middle of the pitch, which led to three yellow cards in a row that were awarded to Dynamo. As the game progressed, the encounter became more evenly matched, although in the closing stages Dynamo managed to organise two dangerous attacking moves: Kanibolotskiy managed to save a Yarmolenko shot only at the second attempt, and then Moraes hit the crossbar following a cross. But it was Shakhtar who said the final word. On 90 minutes, Teixeira rushed towards goal, winning an individual battle against his marker, skipped past Shovkovskiy and was brought down – penalty kick. The goalkeeper was sent off, Dynamo had already run of substitutions, so Dragovic put keeper gloves. Srna converted a spot kick, and soon the Pitmen carved the opposition defence open and Bernard sent the ball into unguarded net to make it 2-0. Dynamo were reduced to nine men after Rybalka’s removal.